Are there any fruits that you just don’t like? For me (Leah) it would be honeydew, cantaloupe, and figs. We made a really promising looking fig cake the other day, and both of us decided we did not like them. They tasted sort of earthy, although not a nice kind of earthy. Sort of like a vegetable but sweet. That’s not something that you want in your dessert at all (although to give figs the benefit of the doubt, maybe the ones we got weren’t that good!). However, I am a big fan of almost any other type of fruit- strawberries, oranges, raspberries, cherries, blackberries, and peaches. When they’re ripe, I think peaches might be my favorite. They are one of the best things about summer (relatively speaking, of course). Another great thing about summer is, of course, ice cream. While I don’t really like fruit crisps/crumbles (I do like cobblers), I really loved this ice cream. 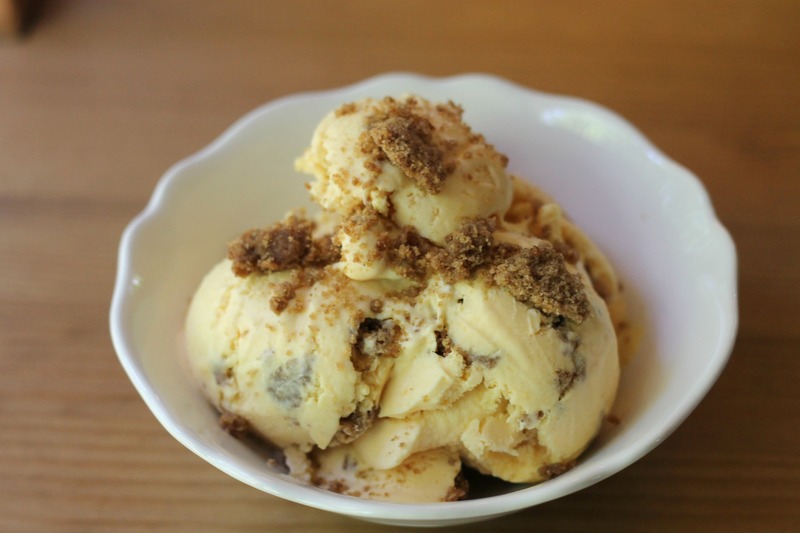 In fact, it might just be my favorite ice cream that we have made. Well, the dulce de leche and cannoli ice creams were fabulous as well, so it would be very hard to choose! What makes this ice cream so perfect? Well, it starts out with a smooth, rich, tart, and super-peachy ice cream base. On it’s own, it is already the best peach ice cream that I have ever eaten. Then, you stir in pieces of crispy streusel. The combination is unbeatable. 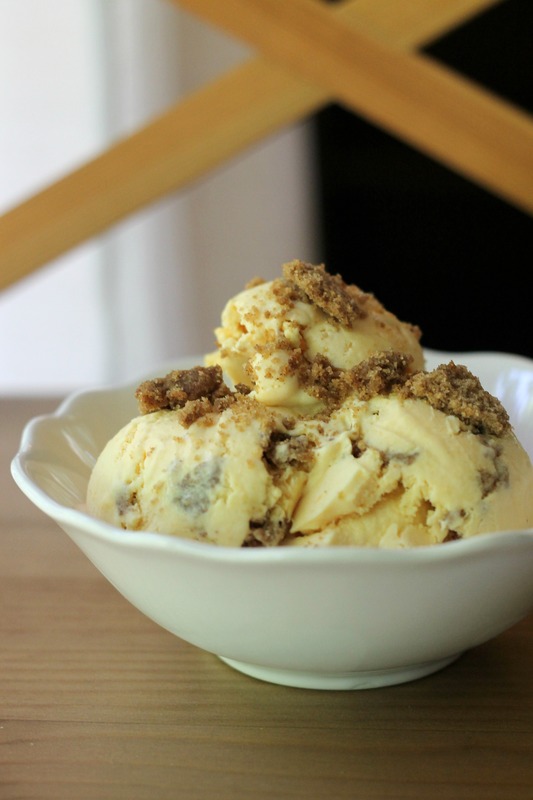 Before peach season is over, give this ice cream a try- it might just be the best ice cream you will eat all summer! Bake at 375 degrees until golden brown, about 10-15 minutes. Let the crumble cool and then break it apart into small pieces. Peel the peaches and cut into chunks over a medium saucepan, making sure to catch all the juice in the pan. Cook over medium heat with the water, stirring occasionally, until the peaches are soft and cooked through, about 10 minutes or so. Remove from the heat, stir in the sugar, then cool to room temperature. Puree the cooked peaches and liquid with an immersion blender, blender, or food processor; add the cream cheese, heavy cream, vanilla, and lemon juice. Blend until smooth but with some small peach chunks remaining (if you prefer your ice cream completely smooth, puree until as smooth as possible and then strain it). Chill the mixture thoroughly in the refrigerator overnight (or at least 4 hours), then freeze it in your ice cream maker according to the manufacturer’s instructions. 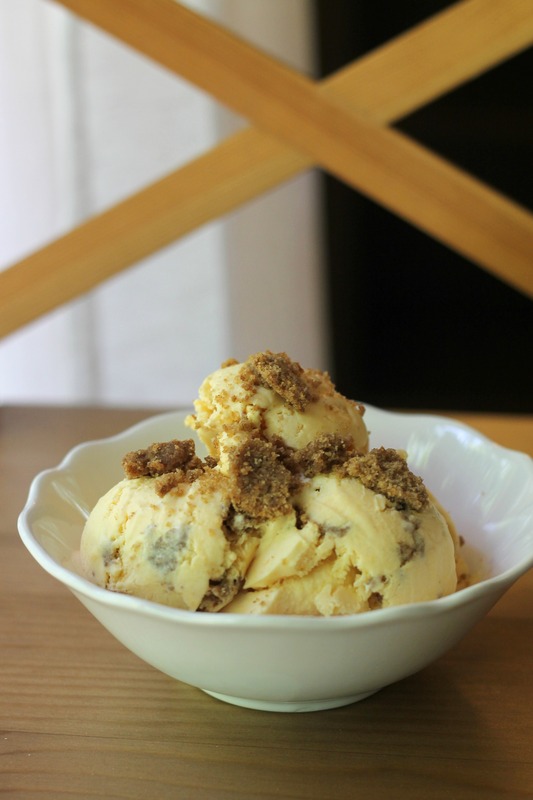 After churning, layer the ice cream with the crumble and freeze until completely firm. Serve and enjoy!